Indigenous peoples across the Arctic practice traditional ways of life closely connected to the waters on which they rely for food. When my friend Austin Ahmasuk, a leader from Nome, Alaska, said this, it really hit me just how dramatically the world is changing for Arctic indigenous peoples whose lives are inextricably tied to the bounty of the sea. Yet the most important international institution for Arctic waters has no indigenous voices weighing in on rules that will profoundly affect the ways of life of the region’s peoples. In fact, that institution had never even heard one. Until this past fall. “We’re very much dependent on marine animals for our diet and sustenance,” said Tagak Curley, an indigenous statesman from Rankin Inlet, Nunavut, Canada. Tagak is one of six indigenous leaders Pacific Environment invited to London to address the International Maritime Organization (IMO), a U.N. agency that imposes environmental and safety rules on ships. In assembly sessions and one-on-one meetings, the indigenous leaders vividly described to international policy makers what’s at stake for Arctic communities in the face of melting sea ice and an anticipated exponential increase in ship traffic. When a ship approaches, marine mammals often flee to get away from the vessel, pushing them out of indigenous hunting areas. 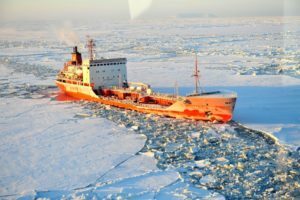 As melting sea ice opens up new routes and extends the shipping season, this is happening more often and in more places than ever before. As a result, hunters have to travel farther than ever, at greater personal risk, and with less certainty of where to find the animals they rely on for food. The indigenous leaders also warned about a toxic, cheap fuel oil that powers ships traveling through the Arctic. When burned, it spews lung-irritating, heat-capturing “black carbon” soot that settles on sea ice and accelerates Arctic warming. If spilled, this dangerous oil would be impossible to clean up in Arctic conditions and would devastate wildlife and cause long-term damage to Arctic ecosystems and indigenous food security. “We don’t need it up here, said Tagak. “That’s definitely one we’ll be pushing to see that it is banned from the Arctic.” Indeed, this toxic oil has already been banned in the Antarctic. The Arctic panelists made a deep impression on their audience. The IMO Secretary-General Kitack Lim was so moved, he did something unusual: He made a personal statement on the importance of hearing directly from indigenous Arctic peoples. Connecting Arctic indigenous peoples to policy makers was only a first step. Pacific Environment is now collaborating with indigenous leaders to determine how they can become a permanent presence at IMO negotiations. 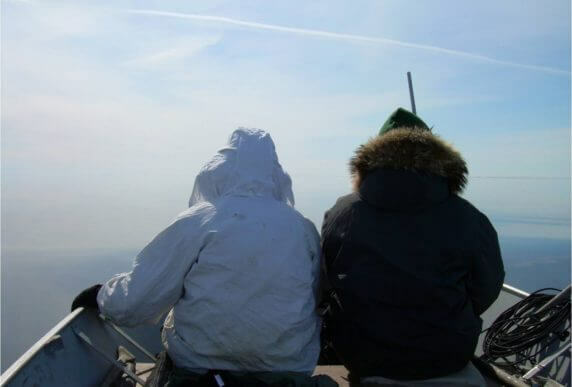 The testimonials of these leaders made it very clear to the U.N. delegates that indigenous peoples need their voices heard, and that no one else—not environmental groups, not national governments—can adequately represent the unique mosaic of Arctic indigenous peoples. “We would like for our indigenous people to have a seat at the table during these changing times. Pacific Environment realizes how the ocean is our garden, and I’m truly grateful that they helped us be part of this important process and will continue doing so in the future,” said Verner Wilson III of Bristol Bay, Alaska.